Last night, I had fish and chips for the first time. I am amazed at how much fish I eat now--LOL. Both of us have been craving chips (fries) and we decided to go pick up something for supper. We could have gone in one direction and gotten to Kebab King. Not sure whether that is some kind of chain or not. 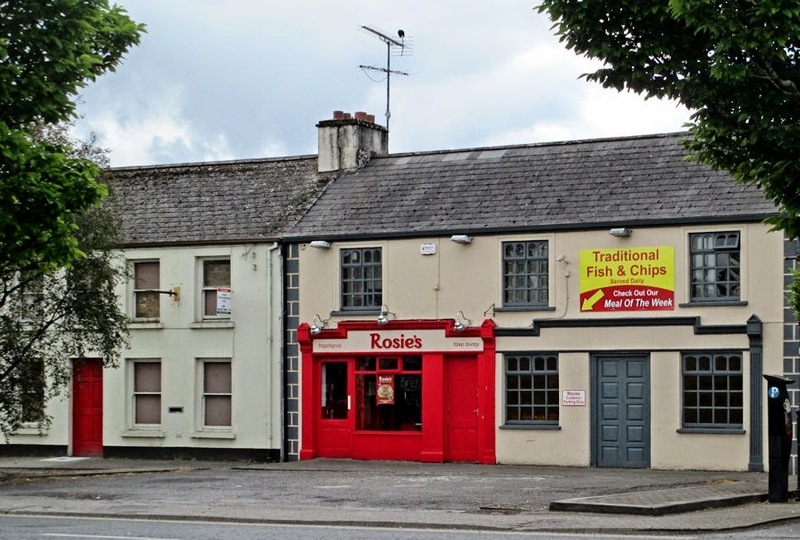 In the other direction, there was Supermacs, which is a chain--they are all over the place--or we could go just a few steps further across the street and go to Rosie's Takeaway, which I think isn't a chain. We opted for the latter. The first day we were in town I told Bill we should go there sometime and try the fish and chips (there's a big banner on the wall outside announcing the availability of traditional fish and chips). We went in and both of decided that we would get that. It's a small little place with a few tables for eating in, but we chose takeaway. They have burgers, various sorts of fried chicken--like tenders and sandwiches and wraps made out of them. They also have what are called “chicken burgers.” If I had not already spent some time investigating what is on offer at the local grocery stores, I might have thought that this was a burger made with ground chicken. I knew, though, that a chicken burger is what I call a chicken patty. It’s a fried, breaded chicken patty on a bun. Interestingly, the chips (fries) here seem to commonly be available with various kinds of sauces or toppings. You can get different flavors on the side--the flavors seem to be the same everywhere--taco, garlic, curry, among others. We didn’t get any sauces. We both briefly pondered onion rings as well and thought they sounded good, but figured that since we are not used to eating fried food, we might want to skip them this time. That was wise, because we each got a box that contained a lot of food. 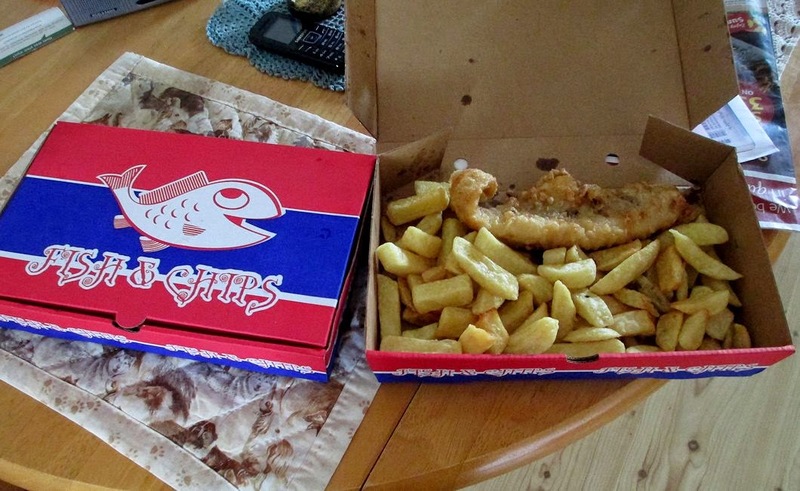 I was surprised at how big the piece of fish was and there was an ample portion of chips to go with it! Bill got his sprinkled with salt and vinegar. There were packets of ketchup, malt vinegar, and tartar sauce available as well. I wouldn’t want to eat this way all the time, but I was hungry and it was really good! Both of us agreed that we would go back there again. The food was tasty, reasonably priced (it was 6.20 euro for each meal), and still very hot when we got home. It fed a craving. The place is conveniently located. I told Bill that maybe next time we could split an order of fish and chips and then have room for some onion rings, too. Next time will not be for a while, I am sure! This is the second time we have been out to eat since we arrived 8 weeks ago and the first time was the day we arrived. Still, it’s nice to know that the place is there for when the craving for chips comes back!! I learned after supper that it was National Fish and Chips Day--who knew? Today we went to Tesco and I bought the only slow cooker I have seen here. It's 3 litres, so it's small. I hesitated for weeks before buying it because I felt a larger one might be better. I had a 4-quart and a 7-quart in Maine and I used the larger one the most. These are simply not popular here, though, and I did not have anything else to choose! I could have my pick of deep fat fryers--they are everywhere. I do not think I have ever seen as wide a selection of fryers anywhere, but not so for slow cookers. I finally decided that I should just get it. It's small, but I was cooking for 3 adults in Maine and I planned leftovers. There are two of us now, so this one will be fine for chicken, dried beans, and stuff like that. It will also be easier to pack up and take with us. Besides, my oven is crap and I needed some other way to cook bone-in chicken pieces and whole chickens!! The owner's manual for the oven suggests cooking chicken thighs for 2 hours and salmon for half an hour!!! I don't think so. Now I can just cook stuff in the slow cooker overnight, during off-peak electricity hours. The oven will be fine for the occasional frozen pizza and not much else. Won't have to worry about cleaning it!